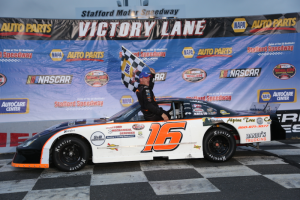 STAFFORD – For some drivers the start of a race at Stafford Motor Speedway means settling in, setting a strategy and patiently waiting for the time to move. On Friday night the word patience didn’t exist for Late Model division driver Michael Bennett. The green flag to start meant it was rush hour for the Stafford driver. Bennett went from the fourth starting spot to the lead within a quarter-lap of action Friday and went on to lead every circuit on the way to victory in the 30-lap Late Model feature at Stafford. Glen Reen of Wilbraham, Mass. was second and Tom Fearn of East Longmeadow, Mass. third. It was the second victory in seven starts this year for Bennett. Vince Gambacorta of Ellington scored victory in the 15-lap DARE Stock feature. Zack Robinson of Putnam was second and Johnny Walker of Ludlow, Mass. third. It was the first victory Gambacorta since 2006. The late model race was a real snoozer! After lap 1 the race was over. An old man wins against the kids in the Dare division. Who doesn’t think that’s pretty cool. Late Models- Boo. 12 Cars and spread way out at the end. As usual. Wray put a video of his race on youtube and the problem with Late Models at Stafford seems clear. They are too fast for the tires. He was sawing on the steering wheel in the corners the entire race. No passing in the front six cars and intervals that were way too far apart. It’s not a driver or team problem it’s a rules problem. Over powered and under tired.